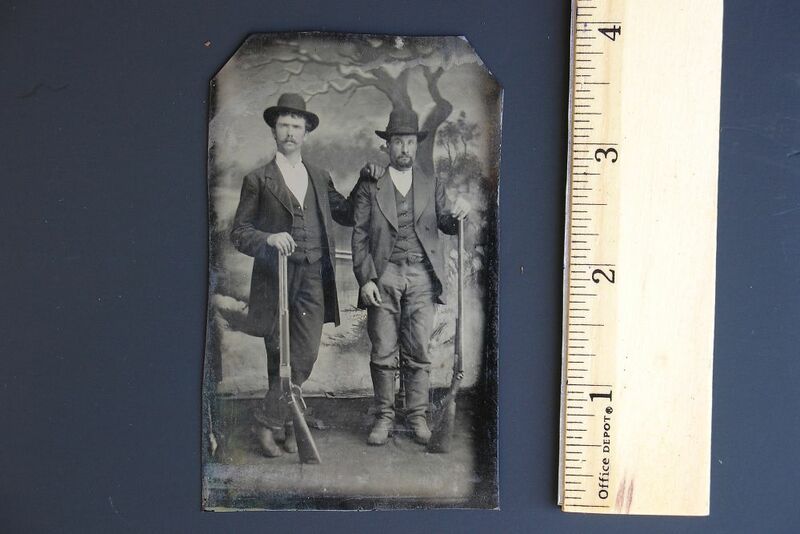 This is a nice old tintype photograph of two men holding a Winchester 1st Model 1873 Rifle and an early Parker Hammer Shotgun with lifter action. 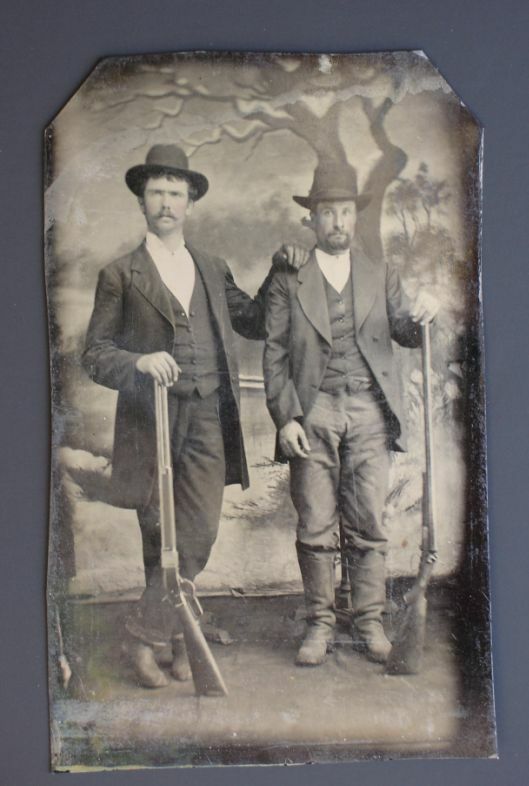 I'm not an expert but tintypes seem to be at their strongest during the 1870's and 80's. At any rate, these two gentlemen are brandishing some pretty good firepower for back in the day. One thing that tells me they're not ordinary hunters is they both are carrying different kinds of weapons. Usually, when you see hunters...they all have one type of weapon...i.e. all rifles....or duck hunters are naturally going to be posing with shotguns. So a rifle and a shotgun is not unheard of...but I think this would pertain a little more towards lawmen. If that's the case....I'm sure you can guess which one is the Sheriff and whose the deputy. The guy on the right looks a little bit like he swallowed a canary...probably because he's been told not to move by the photographer so the image won't blur...and also because there is scaffolding bracing their backs....which photographers used back then to get their subjects to stand still. The Winchester is a Model 1873 and a scarce first model rifle or late at THAT! Note the height of the forward end of the frame for the mortised dust cover. Also check out the position of the tang screws and exposed hammer screws. The short rear sight is also a giveaway to an early production 1873. The shotgun is an early Parker Hammer gun with a lifter action. The real giveaway though is the back action lockplate...Parker only built this type from 1869-1872. Photo itself is in very good condition with no bend or damage. It measures approx. 2 1/2" by 4".